ThreeHundredEight.com: What are the polls really showing in Sudbury? Odd, Forum is usually produces polls that are the most favorable to the Liberals. Forum byelection polls tend to exaggerate Liberal momentum or performance in Tory-Liberal races. In NDP-Liberal races, they have been pretty accurate - If anything, they have favoured the NDP slightly. Well, yes & no. Forum is somewhat erratic & unpredictable. Sometimes they have high Liberal numbers, but sometimes they may end up hurting the Liberals by producing inaccurate polling numbers like they did in Brandon-Souris (& Fort McMurray). As for this by-election, one would assume Oracle knows the Northern territory since they are based there whereas Forum seems to be more familiar with Toronto, as Eric says. Great analysis, Eric. I'm with one of the campaigns here in Sudbury - not Andrew Olivier's - and I can tell you that we were in complete disbelief regarding where Forum put him in their first poll. However, the "surge" that Forum insisted happened to Olivier has certainly played well for his campaign narrative. We Sudburians have become fairly politically engaged in the last several years, but speaking with voters this time out, it's clear that the constant negativity is turning a lot of people off, and even those who are aware that there's a by-election going on and may be somewhat engaged in it are saying they'll be staying at home rather than voting for anyone. And that's really too bad. I had hoped that my community might show up the rest of Canada for turnout in a by-election, but now, I'm not so sure. There's also been a very active "refuse to vote" campaign underway on social media here. It's certainly been a very interesting, if unusual, by-election. And we get to do it all over again now in a few months, federally! The Government of Saskatchewan would dispute that page. Their documents consistently refer to the residents of Saskatchewan as "Saskatchewan People". They should be Saskatchweigians in English. Wynne really wants to take back Sudbury. Jean Chretien is campaigning for Thibeault today. A recent Toronto Star article claimed that Wynne is not fond of Horwath and wants to "put her in her place" hence the Liberals are really going all out for this by-election. I believe it is a three-way race between the Liberals, NDP and independent Olivier. However, the Liberals do have the advantage as they can still ride on the post-election honeymoon. Moreover, I don't see Thibeault party switching having a negative impact on him other than with NDP loyalists who may have felt betrayed. 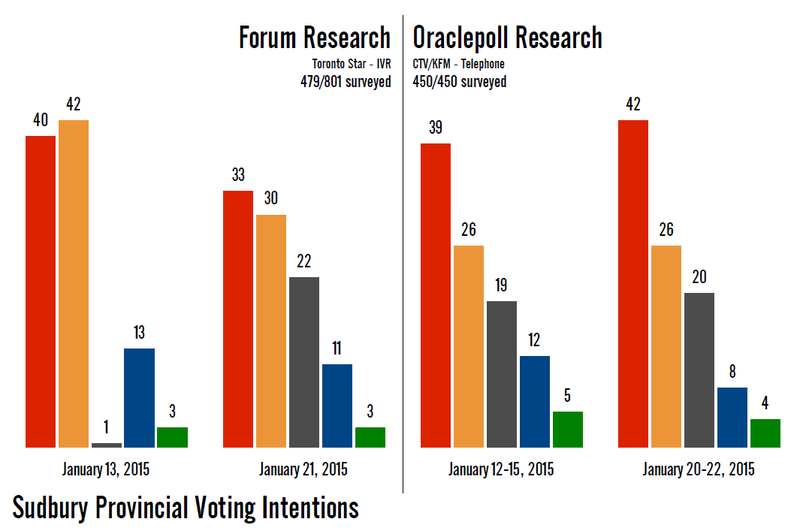 So is Oracle considered a well-respected pollster in Northern Ontario then? That seems to be conclusion one can take from this article. Does it have a good track record in that region in the past? Glenn Thibeault will win. Federally, this seat will go liberal,its not a toss-up. A former mayor is running for fed liberals. She has name recognition. I still feel that cons won whitby oshawa because a mayor ran for them. Do you know what language the polls were conducted in? The riding of Sudbury is 1/4 francophone so to get a representative sample, polling should be done in both languages. As this is not the case in most Ontario ridings, Forum (based in Toronto) might not have thought of it and it could account for part of the discrepancy. This is especially the case since traditionally in the riding, francophones voted Liberal in higher proportions than Anglophones. Really good point. I suspect any pollster based out of Sudbruy would conduct interview in both languages. Your point about Sudburian francophones historically voting Liberal is interesting. As you probably know, the surrounding communities have a considerably higher proportion of francophones, and those areas lean NDP. Forum does not say on its web site that it calls cell phones but Lorne Bozinoff claimed the firm did in an interview with the Toronto Star last summer. They ought to be explicit about this in their statement of methodology. I don't doubt that Forum does call cell phones in some of their polls. But I seem to recall Forum saying they don't call cell phones for by-election polling - though I'm not sure if I am misremembering that. I find it very sad to hear of a 'dont vote' movement. Any of those are just self defeating - if few vote then the established parties are extremely happy as it means that the most important thing is to get your own voters out and they are good at that. Far better to either support the independent candidate or go for one of the parties that were not involved in the twin messes (the NDP whose member quit right after an election, the Liberals who poached a federal NDP member thus forcing another byelection). I'm a Green supporter so I was hoping voters there would say 'screw the big 3, lets send a strong message we are sick of business as usual' but instead it looks like efforts to not vote will result in a Liberal win, which will just support business as usual. Sigh. I think most are just fed up with corruption and don't see the point in voting. Problem is, the more you stay away the worse it will get. The scariest thing to a party in power is an engaged electorate. exactly, which is why Harper & Co. have been undermining voting accessibility, etc. Given that new federal poll from Forum, I wonder if they've recently changed their methodology. Why do you say that? Lately, they've had the Conservatives higher than anyone else, so not surprising they have them ahead by one point. The 12 highest Liberal results since the last election have all been Forum polls. Forum tends to rate the Liberals very highly, and on this one they've fallen neatly amidst the cross-pollster average. Two polls ago, Forum showed the Liberals at 41. That's true, but they've also been the highest for the Conservatives over the last few months, averaging about 34% compared to 31% for other pollsters. They've averaged 37% for the Liberals, compared to 35% for everyone else. A question about Forum, why have the last 2 Forum polls had Andre Arthur winning Portneuf-Jaques-Cartier back? Even when the NDP were at their lowest levels in Forum polling they never had Arthur winning, but all of a sudden they do in 2 polls? I can only speculate as to Forum's motivations. However, the Conservative party is up 2-3% since Beaulieu became BQ leader. Arthur is known as a conservative so perhaps Forum is assuming a rising Cionservative tide lifts all conservative boats. If I had to guess, Forum is doing what I used to do. That is, adjust Arthur's numbers as if he is a Conservative. But it is a little silly for them to make a point of it, since there is absolutely no indication that Arthur is running again. Why not just count that riding as Conservative and avoid making such an odd statement? Does the riding encompass the billing area? Isn't the city rather larger than the riding, including a chunk of the Nickel Belt riding as well as the eponymous riding? Any thoughts on the Mainstreet poll released today? Check out my CBC article tomorrow. My take is since a NDP MPP resigned, the NDP is unlikely to win the riding. A portion of voters will want to punish the NDP for causing an unneeded by-election and wasting voters votes at the election. Normally this would be enough to guarantee a Liberal victory. I don't live in the ridings so I have no knowledge as to whether enough local popularity exists for Andrew Oliver to become a M.P.P. from my reading of the tea leaves it doesn't appear Oliver has much of a hope unless he can capture NDP voters. My take is that there are four type of voters that can go for Olivier. 2. Liberals who are upset at how the ex-NDP Thibeault was nominated as candidate for their party. 3. People who traditionally lean towards NDP, but want to punish the NDP for two resignations. 4. Tories who may support Olivier as the best candidate to beat both the Liberals and NDP.